New troopers and inspectors recently completed 26 weeks of comprehensive training. Governor Tony Evers helped swear-in 16 new Wisconsin State Patrol officers during a graduation ceremony Friday in La Crosse. 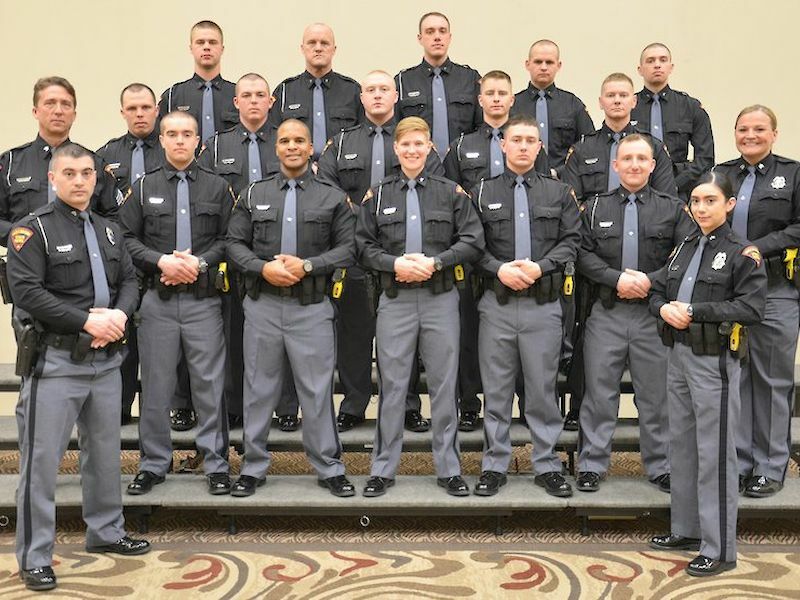 Members of the State Patrol’s 64th Recruit Class recently completed 26 weeks of comprehensive training that began September 16, 2018 at the Wisconsin State Patrol Academy at Fort McCoy. The recent graduates have been assigned to work from one of the State Patrol’s seven regional posts. A total of 13 will begin their service as troopers with three working as inspectors. Troopers and inspectors have similar law enforcement authorities and frequently are patrolling highways, enforcing traffic laws and assisting stranded motorists. Inspectors receive additional training related to federal motor carrier regulations impacting large trucks, buses and other commercial motor vehicles, and often work at one of the state’s 13 Safety and Weight Enforcement Facilities. State Patrol officers serve in many other roles including crash reconstruction experts, airplane pilots, dignitary protection, K-9 and motorcycle officers. 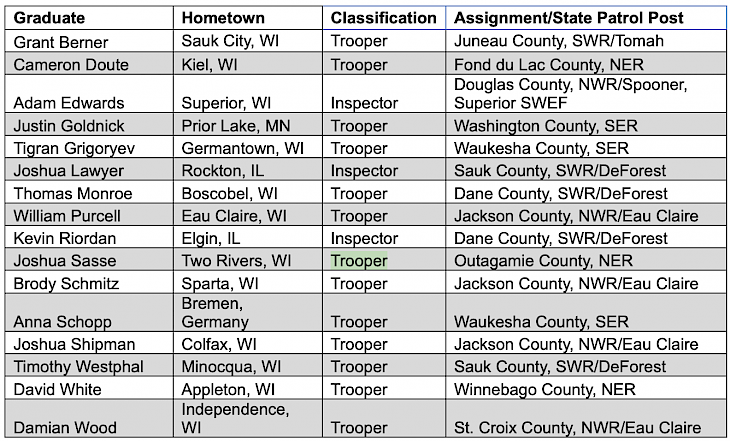 Last year, Wisconsin State Patrol officers made 225,111 traffic stops, handled 39,525 motorist assists, and inspected 36,592 commercial motor vehicles. A recruitment effort is currently underway for the next State Patrol cadet class that will begin training this fall. The application deadline is March 31, 2019. During their comprehensive, six-month training at the State Patrol Academy, State Patrol cadets learn about traffic and criminal laws, emergency vehicle operations and lifesaving skills, firearms proficiency, communications and crisis management. Below is a list of the new officers, their hometowns, positions and assignments.